The lithium in lithium orotate is a naturally-occuring trace mineral with a long history of therapeutic use for supporting a healthy mood and a healthy stress response. When bound to orotic acid as lithium orotate, the result is functional nutrition for a healthy mood, healthy stress response, and healthy cognitive function. Each enteric-coated tablet provides 4.6 mg of elemental lithium. Lithium orotate (the lithium salt of orotic acid) is 20 times more bio-active than other lithium salts, allowing a reduction in dosage which greatly reduces the likelihood and severity of potential side effects. Orotates are organic "carriers" that transports the natural Lithium exactly where it needs to be delivered so that it reaches the blood cells of the brain. This is where chemical imbalances occur. When organic Lithium is combined with Orotate, it is reported to be many times more effective than the chemical, inorganic Lithium and to have NO side effects. Dr. Hans Nieper's theoretical explanations of the mechanisms behind his stunning success in the clinical application of sophisticated mineral transporters rely heavily on the concept of the fixed pore mechanism of active transport. The theory called "fixed pore mechanism" suggests that a carrier molecule, in this case Orotic Acid (B-13), is attached to the compound being transported. This research has lead to the creation of mineral chelates called orotic acid chelates, or orotates which offers a 20 fold increase in utilizing minerals. In his writings on lithium orotate, Dr. Hans Nieper stressed how the primary function of lithium was the restoration of the proper electrical membrane potential by removing excess sodium from the inside of the cell. In the orotate form he was able to obtain results using small dosages, about 7% of the synthetic carbonate form. He reported that 5 mg of lithium orotate are closely equivalent to 100 mg of the synthetic carbonate form. 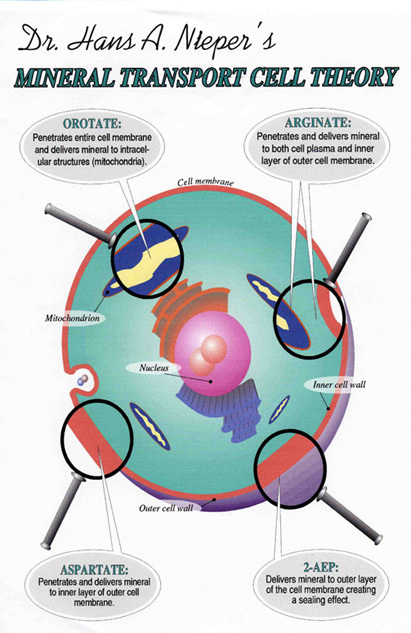 According to Dr. Nieper, the lithium orotate releases lithium ions at the lysosomal membranes (structures within the cells), and withdraws sodium from them. The net result is a stabilization of the lysosomal membrane. If lysosomal enzymes are released within the cell they cause a cascade of destruction that leads to cellular death. The stabilization of the lysosomal membranes within the cell is a vitally important part of maintaining cellular health. In 1998 a break-through discovery was reported by researchers from the National Institutes of Health in Bethesda, Maryland. They discovered that neurons (from rat brains) that were treated with lithium for six to seven days were completely protected from glutamate toxicity. It seems that the lithium attached itself to the receptors where the glutamate normally docks. This prevented the hyperactivity and resultant overload of calcium into the cell. This exciting new understanding of one of lithium's protective actions against neurotoxicity from excessive glutamate opens the doorway for increased utilization of low dose lithium orotate. It appears that both lithium and B12 (in the methylcobalamin form) have a very beneficial role to play in protecting the human brain from this destructive neurotoxic process. The following are excerpts and quotes from an article by Ward Dean, M.D. and Jim English. Please consult with your healthcare professional before using Lithium Orotate. The orotic form of lithium is transported directly to the intracellular membranes of mitochondrial, lysosomes and the glia cells. It stabilizes the lysosomal membranes and prevents the enzyme reactions that are responsible for sodium depletion and dehydration effects of other lithium salts making it a far superior source than the pharmaceutical forms of lithium and far safer too. Lithium protects against the shrinkage of the prefrontal cortex and the reductions in glial cell density, which are otherwise seen in bipolar depression. It may provide the growth-promoting support necessary to restore, enhance, and maintain normal synaptic connectivity. Lithium has been found to be one of the most effective treatments for manic-depressive illness (bi-polar disorder). Normally these patients are given antidepressant drugs which are known to deplete body stores of L-carnitine and Taurine. These amino acids should be supplemented using several grams daily to ameliorate the adverse side effects of these drugs. Of course it would be better to avoid these drugs all together and that is what Lithium Orotate enables many to accomplish. This is an important consideration, especially when the therapeutic dose of lithium orotate for cases of severe depression is 150 mg/day (1-2 tablets), compared to 900-1800 mg of the prescription forms. In this dosage range, there are no adverse lithium side effects and no need for blood monitoring. Other Ingredients: Magnesium carbonate, Avicel, Duratex, Pure Food Glaze, Compritol, Ac-Di-Sol, Plasdone, Magnesium Stearate. Contains no yeast, corn, starch, fructose, lactose, artificial coloring or flavoring. Take 1 tablet 2-3 times daily with meals or as directed by your healthcare professional. Dr. Nieper advised and rid the ailing former president Ronald Reagan of his cancer. He treated thousands of everyday people like you and me. Nancy Sinatra lavished praise on this great German physician: "He is a fabulous person, a recognized scientist, a marvelous doctor." His patients both loved and respected him. Dr. Nieper is reported to have one of the highest cure rates for cancer in the medical world. His success with Depression, Migraines and Bi-polar disorder using Lithium Orotate is unsurpassed. He developed natural medications which were reviewed and approved by the German Government for cancer and the only official MS treatment. One of his most important precepts was: "Cancer cannot be treated as a local disease. Cancer infests the entire body; therefore, the entire body must be strengthened." This is why he treated disorders at the cellular level with non-toxic substances. Dr. Nieper's patients included many world stars, royalty and politicians, including Ronald Reagan, Princess Caroline of Monaco, Anthony Quinn, John Wayne and Yul Brynner. He is the man who invented Mineral Carriers, the 4 different substances used to transport minerals to the cellular level. These are undoubtedly the most assimiable form of minerals that people can digest in dietary supplement form. Dr. Nieper called 2-AEP his "Anti-Aging Formula". In studies done with 2-AEP over a 4 year period, those treated with 2-AEP (approximately 4,000) did not age as rapidly as those not treated. The appearance and elasticity of the skin, as well as the organs' functions "did not appear to age almost at all." Furthermore, Dr. Nieper points out that "none got cancer." 2-AEP has been approved by the German Health Authority (FDA equivalent) as an official treatment for Multiple Sclerosis. 2-AEP strengthens the cell walls. Their electro-static energy increases to defend against diseases and to keep "free-radicals" from entering and infecting our healthy cells. 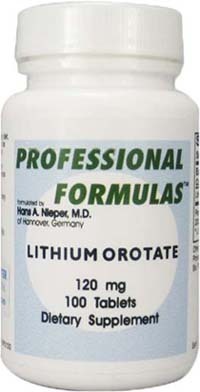 Lithium Orotate for treating Depression, Mania and Bi-polar disorders. Bromelain for its deshielding properties in cancer therapy. Gene repair substances like Iridodial and Dionaea Muscipula (Venus Fly Trap) to attack unhealthy cells and viruses. Unique transporting capabilities of mineral carriers such as the 2-AEP, Aspartates, Arginates and Orotates. The unsurpassed Anti-Ageing success with 2-AEP. Treatment of MS with calcium AEP. Rybakowski JK. Antiviral and immunomodulatory effect of lithium. Pharmacopsychiatry. 2000;33(5):159-64. Cernescu C, Popescu L, Constantinescu S, Cernescu S. Antiviral effect of lithium chloride. Virologie. 1988;39(2):93-101. Tabata I, Schluter J, Gulve EA, Holloszy JO. Lithium increases susceptibility of muscle glucose transport to stimulation by various agents. Diabetes. 1994;43(7):903-7. Hu M, Wu H, Chao C. Assisting effects of lithium on hypoglycemic treatment in patients with diabetes. Biol Trace Elem Res. 1997;60(1-2):131-7. Sartori HE. Lithium orotate in the treatment of alcoholism and related conditions. Alcohol. 1986;3(2):97-100. Lanphier, NP, CN, CH, HHP Loretta. Benefits of Lithium Orotate. Orotates and Mineral Transporters - Fact or Fiction. Ed Sharpe. Evidence suggests that people with mania or depression may lose brain cells. Lithium may thwart that cell death. A study by Chuang and his colleagues reveals that lithium protects brain cells from being stimulated to death by glutamate, one of the many chemicals that transmit messages in the brain. Their new data suggest that lithium may calm overexcited areas of the brain or, more provocatively, preserve the life of brain (glial) cells whose presence guards against manic depression. It was also reported that it does take a week or two for the neuro-protective effects of lithium to fully take place. Lithium supplementation shields neurons and intact brains alike against insults as wide-ranging as excessive doses of anticonvulsant medications, deprival of growth factors or essential electrolytes, the Alzheimer’s protein amyloid, and neurotoxins like oubain, quinolinic acid, and MPP+. Lithium supplements decrease the number of brain cells killed by experimental strokes by 40%, and help the animals to recover their balance and motility more quickly. Remarkably, most of these benefits can be gained even after the model stroke is over. Lithium supplements also aid brain regeneration in animal models of Huntington’s disease. (the frying of brain cells by over stimulation). It does this through precision modulating of the N-methyl-D-aspartate (NMA) receptor’s response to the stimulatory neurotransmitter glutamate. Glutamate binds to a cell surface protein of the NMDA receptors when it excites a cell. Normally, activation of the NMDA receptor by glutamate triggers an influx of calcium ions, setting off a signaling cascade inside cells. However, cells treated with lithium let in far less calcium when exposed to glutamate. Lithium has a “push/pull” effect on glutamate raising its levels when they are too low and lowering them when they are too high by modulating it reuptake. This balancing act helps to prevent both excessive stimulation (which kills brain cells and inadequate activation of the NMDA receptor which interferes with normal activation and function of nerve cells needed for mood and memory. In people with manic depression, lithium may correct a dysfunction of the NMDA receptor by limiting calcium influx, speculates Chuang. Lithium Orotate increases levels of the major neuroprotective protein bcl-2 in brain cells. Bcl-2 is a cell survival protein which inhibits cell death in response to a wide range of neurotoxins and cellular stressors, including large doses of cortisol (prednisone), ionizing radiation, free radicals, chemicals that deplete brain cells of the antioxidant reduced glutathione (GSH), and deprivation of crucial brain growth factors. Beyond its abilities to protect brain cells from toxic assault, it’s now emerging that lithium, acting through bcl-2, also helps to regenerate nerve cells, activating a genetic program (the ERK/MAP kinase pathway) that stimulates the growth of new axons and promoting the sprouting of new neurites (the branching “tips” of nerve cells which bridge the gap between neurons). Lithium Orotatesupplementation increases levels of N-acetylaspartate (a marker of brain cell viability and function). But more than that: Researchers have documented increases in grey matter in humans taking lithium supplements for just four weeks – with the largest increases occurring in the hippocampus, a region of the brain crucial for moving short-term memories into long-term storage, and which is the first and most severely-hit area of the brain in victims of Alzheimer’s disease. Importantly, these selective effects were specifically observed in areas where atrophy had previously occurred. Dr. Nieper points out that “it is not unusual for orthodox medicine to be quite helpless in the treatment of chronic liver ailments, especially chronic immunological liver inflammation. In these chronic liver inflammations…the continued release of lysosomal enzymes plays a role. These are very aggressive, cell-destroying enzymes released by little bubbles in the cell plasma known as lysosomes. These lysosomes exist not so much in the liver cells themselves, as the cells of the liver’s supportive connective tissue. One could attempt to seal the walls of these lysosomal bubbles, to prevent the release of these aggressive enzymes. In fact, a possibility for this exists. It is feasible to release calcium at the lysosome membranes by specifically transporting it there. This can be achieved by means of the special compound, calcium orotate. The famous mineral springs of Europe, such as Vichy in France, all have high lithium waters and are in high demand for liver cures. One of its mechanisms of action is displacing sodium with lithium in liver cells. This has the effect of softening the liver and facilitating other medicines into the liver. This form of lithium does not build-up in the blood to dangerous levels as the carbonate, citrate, and acetate forms do. This is simply because it’s absorbed by the cells much more readily than other forms. Lithium orotate is often used with calcium orotate for high liver enzymes. For normal applications Dr. Nieper recommended 1 tablet 2 – 3x daily. Occasionally some will experience more fatigue, if so lower the dose. How much elemental lithium is in lithium orotate? Lithium Orotate does not contain GMOs. Why are the tablets enteric-coated? Lithium absorption takes place primarily in the small intestine, regardless of the source or type of the lithium. However, for the most effective absorption rate, the supplement must be formulated and packaged correctly. This means that the natural lithium must be able to reach the small intestine intact. In order to accomplish this with a non-enteric coated capsule, at least 2x the amount must be taken in order to get the same effect as one-two tablets of Dr. Nieper's specially formulated lithium orotate. Dr.Neiper found that mineral transporters work better, when each granule is enterically coated by a micro-vortex process, which ensures intact passage of the compound through the acidic environment of the stomach. Other products who don't utilize this patented process end up providing "free" minerals and amino acids, which aren't targeted (tissue specific). Micro-vortex coating of mineral transporters is when individual granules are enterically coated with a soluable compound which resists the stomach acid and yet is readily dissolved in the alkaline environment of the small intestine. Micro-vortex enteric coating delivers the mineral transporter into the small intestine in tact where it is moved into the blood stream in tact, where the transporters enter the cells and the minerals are released at specific cell sites. Some manufacturers of lithium orotate do not believe that enteric coating is necessary and that the enteric-coating that Dr. Nieper used was for marketing purposes. However, people who actually knew Dr. Nieper disagree with this. After speaking, several years ago, with a person who worked with Dr. Nieper, this person affirmed that Dr. Nieper insisted on the enteric-coating (he called it a micro-vortex process) in order to make sure that the mineral orotate actually reached the small intestine intact so that effective and efficient absorption would take place. Each bottle of Lithium Orotate contains 100 enteric-coated tablets and will last two months. Long-term, large servings of any type of lithium can affect kidney function; however this is usually seen in people with pre-existing kidney issues. Lithium and sodium have similar effects on nerve cells but because it is smaller in size, lithium displaces sodium in the brain. The excessive sodium has to be excreted through the kidneys, which can stress the kidneys. It is very important to stay hydrated when taking lithium orotate. Long-term, large servings of any form of lithium can affect thyroid function, which is usually reversible upon discontinuing use. If you take Lithium Orotate as directed, you will not get a large serving, and should not have an issue. However, always be sure to check with your healthcare provider if you have any thyroid condition. Should I get regular testing while taking lithium orotate? Follow the advice of your healthcare practitioner. Once a year kidney function and thyroid function tests should be performed if you have known thyroid or kidney conditions or as recommended. People with severe thyroid issues or kidney disease should not take lithium orotate. Be sure to talk with your healthcare provider if you have any health concerns. Lithium orotate can interact with a number of prescription medications, including antidepressants, blood pressure medication, anti seizure medications, NSAIDs, and diuretics. If you’re taking these, or any other prescription medication, consult your healthcare practitioner before adding any form of lithium to your routine. Additionally, lithium orotate can interact with some herbal and nutritional supplements, including, but not limited to, St. John’s wort, GABA, tryptophan, 5-HTP, and other supplements that affect neurotransmitters. Lithium orotate may be taken at any time throughout the day. Many people report that taking it after meals is most beneficial. If taken on an empty stomach, lithium orotate may cause mild stomach upset in some individuals. Stay well-hydrated and drink plenty of purified water when taking lithium. How long does it take notice the benefits of lithium orotate? Results vary but some people report feeling benefits in under an hour, while others don’t notice benefits for a few weeks.